AAPG Datapages and the GIS Publications Committee wish to thank Lauri A. Burke and the USGS for allowing the Distribution of Regional Pressure in the Onshore and Offshore Gulf of Mexico Basin, USA project to be posted on Datapages' GIS Open Files page, thereby making it available to the public as a free download. 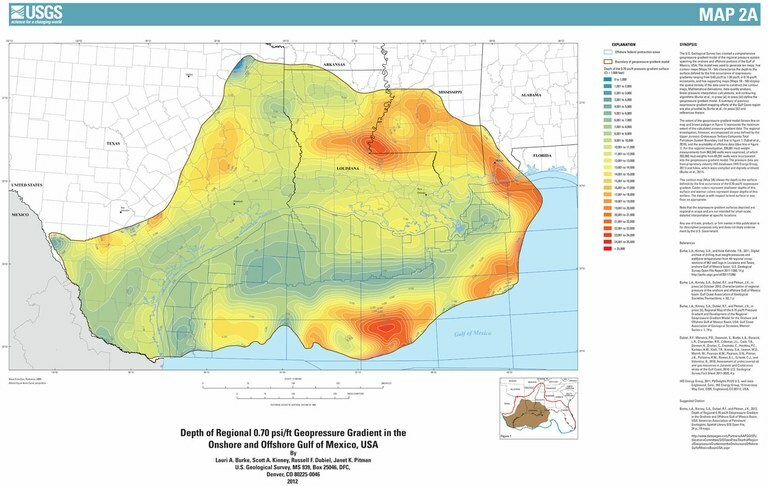 The U.S. Geological Survey (USGS) has created a comprehensive geopressure-gradient model of the regional pressure system spanning the onshore and offshore portions of the Gulf of Mexico, USA. The model was used to generate ten maps: five contour maps (Maps 1A - 5A) characterize the depth to the surface defined by the first occurrence of isopressure-gradients ranging from 0.60 psi/ft to 1.00 psi/ft, in 0.10-psi/ft increments, and five supporting maps (Maps 1B - 5B) display the spatial density of the data used to construct the isopressure-gradient maps. The boundary of the geopressure-gradient model represents the maximum extent of the calculated pressure-gradient data. The regional investigation, however, encompassed an area defined by the USGS Upper Jurassic-Cretaceous-Tertiary Composite Total Petroleum System Boundary, and the availability of offshore data. A description of the geopressure-gradient model, including related mathematical derivations, the data-quality control methodology, linear pressure interpolation calculations, and contouring algorithms is provided by Burke et al. (in press [a]; in press [b]); these references, as well as a summary of the geopressure-gradient model, are supplied in the online documentation. Note that the isopressure-gradient surfaces depicted are regional in scope and are not intended for small-scale, detailed interpretation at specific locations. Please note: This map requires either Esri ArcReader software (which is available as a free download here) or Esri ArcGIS (ArcMap) software.